Solborg lies in Stavanger, a small, cozy town located on the Southwest coast of Norway. Stavanger is also filled with a beautiful, enriching nature. The school has many different classes you can immerse in, each with various travel destinations suited for the course you have chosen. Lessons take place in Norwegian. Solborg Folkehøgskole was established in 1913 and is now one of the largest folk high schools in Norway. 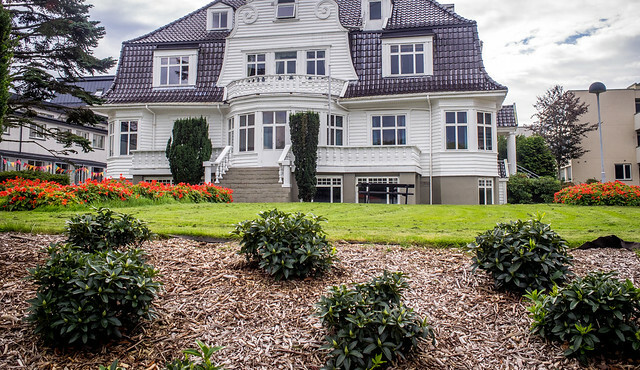 Solborg Folk High School is situated in Stavanger, on the south-west coast of Norway. Folk high schools are one-year boarding schools based on the idea of learning for life. We provide an opportunity for you as a student to grow as a person and as a friend, in a small, unique learning community without exams and grades. These are schools where you broaden your horizon, deepen your social insights, get more confidence in yourself, and learn tools for lifelong learning. The main teaching method is hands-on, you learn by doing. By experiencing the very things you are learning about, your knowledge and understanding become greater and more valid. And you are far more likely to remember something after you’ve seen it applied in real life. Classes are conducted in a free and open spirit, progressing through interactions and dialogues between students and teachers. The owner of Solborg Folk High School is Normisjon which is a voluntary and independent mission agency within the Lutheran Church of Norway. You choose a major subject when applying to Solborg Folk high school. «Multisport Afrika», «Filmproduksjon», «Rampelys Stage», «Musicproduction», «Adventure Action Sport», «Global Village Connect», «Photo South America», «GloBall» (ball games), «Fashion & Design», «Picture, Form & Art», «Life Changing Fitness» and «StreamTeam». The school can accommodate 150 students. The school starts late August and lasts until the middle of May. There is an Autumn Holiday for one week in October, a Christmas holiday for two or three weeks in December/January, a Winter Holiday for one week in February/ March and an Easter Holiday for one week during Easter week. During these holidays, the school will be closed. Classes are held 6 days a week. Attendance is required in all but special circumstances. Even though we do not offer Norwegian tutoring at Solborg, you are given time to read and practice the language on your own. Also, the simple act of socializing with your classmates, teachers and others is an effective way of learning Norwegian. Lessons take place in Norwegian. From June till August the school has an extensive selection of services. Conference hall with 150 seats, which can be expanded into the gymnastic hall, with up to 400 seats. Auditorium with video canon, surround construction, DVD and 80 seats. Another auditorium with video canon, surround construction, DVD and 60 seats. A dining hall with 162 seats, which can be extended to 300 seats. A considerable number of classrooms and group rooms. Leisure room (sitting room) with satelite television. A beautiful garden with an enjoyable walking area. The ground floor of Villa Solborg can be rented out for christening, confirmation, anniversaries etc. The first reaction most people have when they hear about Norwegian folk high schools is “I wish I had an opportunity like that!”. However, a few people react with a touch of skepticism. “A school with no tests and no degrees? What’s the point?” is a common refrain. But to characterize folk high schools in such a way is to miss the point. Folk high schools are one-year boarding schools offering a variety of exciting non-traditional and non-academic subjects, as well as academic subjects. The idea of folk high schools is learning for life, an opportunity to grow both individually, socially, and academically in small learning communities. All students live on campus in close contact with staff and their fellow students. One important part of the folk high school experience is to form a community, in and out of class. The folk high schools do not grant degrees or conduct exams. They are a supplement to the regular education system, with the aim of nurturing “the whole person”. You develop knowledge in a subject you will make use of every day for the rest of your life: yourself. By taking away the pressure of grades and exams, you learn to motivate yourself. You choose the topics that interest you, for instance outdoor life activities, theatre, music, creative arts, photo, media and communications and international solidarity. At Solborg Folk High school our aims also are to promote a better understanding of the environment, to challenge students to active citizenship, to foster interest in cultural values and to learn about Christianity. The term “folk high school” is a literal translation of the Norwegian word folkehøgskole. However, this translation may give you the wrong idea. Folk high schools are not “high schools” in the sense of upper secondary school institutions designed to prepare students for college or work through exams. Folk high schools are separate from the rest of Norway’s educational system. Students can be any age and can have any level of educational experience. Indeed, these are schools for all people, all “folk”. However, almost all students who attend folk high schools are young adults between the ages of 18 and 25. The folk high schools are private schools, but also receive government funding. The consensus is that a year at a folk high school is beneficial to both the individual and to society. Therefore, there is no tuition fee, not even for international students. Everyone pays for room, board, study trips, and teaching materials. The subjects fall into three categories: major subjects, electives and compulsory classes. You choose one major subject and a few electives. Folk high school, what is it not! It is important to emphasize that, by law, folk high schools conduct no formal examinations and issue no degrees. After finishing your school year, you will receive a diploma detailing what you have participated in. The folk high school have different courses from the regular education system in Norway. International students at a folk high school who want to continue to study in Norway do not automatically qualify for enrollment as students in a Norwegian college or university; they must meet the same entry requirements as other international students. Stavanger is Norway’s energy capital and elected European Capital of Culture 2008. It is the centre of the third largest metropolitan area in the country. The city is a charming combination of new and old. Nearby you will find beaches, fjords and mountains. Research, higher education and culture are important pillars in Stavanger’s infrastructure. At the same time the city has a lot to offer children and young people. Festivals and events include both the petroleum industry, food from the field to the table, humour, jazz and classical music. Cultural events flourish in a city with a long tradition and history, and with a city centre consisting of small houses and cobblestone streets. From the astonishing Lysefjord in the east, to the moody North Sea in the west; from Sirevåg village in the south, to Tungenes lighthouse in the north – varied adventures and unforgettable sights await our visitors. Fjords and mountains, a myriad of islands, beaches and polished rockfaces, lighthouses, heather-covered hillsides, raging rivers and cascading waterfalls, golden grain fields, sheep and cows grazing on green pastures, ancient grave mounds and pulsating city life. Imagine yourself perched on Pulpit Rock, peering down its sheer 600 metres into the blue-green fjord. Or imagine the waves lifting your surfboard into a sense of total flow and freedom. The sea and the earth – elements that have been the basis for life ever since the first hunter-gatherers arrived just after the Ice Age. Thanks to skilled hands and wise heads, they are still the basis of modern prosperity. Fishing and agriculture, shipping, trade and industry. And culture, mind you – a thriving culture. Apply via this online form.